The right handed helix is illustrated in the article cited above as perhaps the most famous scientific diagram of the 20th century (as recounted in the TV program by Marcus du Sautoy). It was drawn by Odile Crick, a professional artist, and it is easily her best known work (the original, sadly, appears lost). Many say it has never been bettered; I do not reproduce it here for fear of copyright infringement, but you can see Odile (who died only recently) and her diagram here. One however has to go to the Watson-Crick (WC) full paper (DOI: 10.1098/rspa.1954.0101) for an explanation of why they decided the helix was right-handed, or (P)- in CIP terminology. In my opinion (as a chemist), this is a far better read than the short and more famous note in Nature. There (on page 87) one finds the immortal statement “we find by trial and error that the model can only be built in a right-handed sense”. They follow that remark with another which I will quote later in this post. But the preceding observation is footnoted, and that footnote must rank as one of the most unheralded in science (unlike e.g. Fermat’s). For this footnote notes another article, published just two years earlier (DOI: 10.1038/168271a0) in which the absolute handedness of a small molecule was finally confirmed after ~50 years. 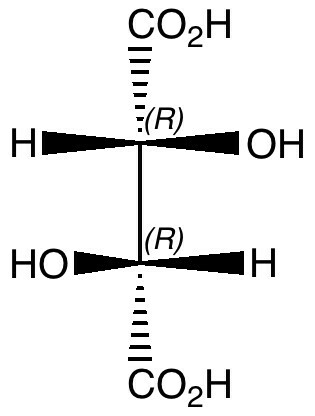 The molecule is shown below, and again in modern CIP terminology, the two chiral carbon atoms both have (R) configurations rather than (S). Until this point, the (R) configuration had merely been a guess with an evens chance of it being right (and had it been wrong, imagine how many textbook diagrams would have needed changing!). The absolute configuration of natural tartaric acid. Chemists had, in the preceding 50 years, by synthesis and transformation, connected the configuration of tartrate to the ribose sugars that form the linker in DNA, and so Watson and Crick built their famous model of DNA assured in the knowledge that the absolute configuration of their ribose sugar was correct. But that assurance, it is important to remember, had only come two years earlier! 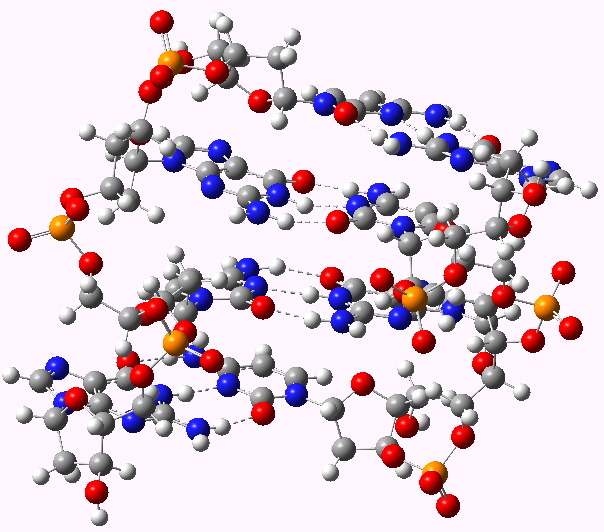 The (correct) structure of DNA was very much a discovery of its time, and this connection between tartrate and DNA I think deserves the accolade of great connections in science (I write this in the Semantic Web sense). On to another statement to be found in the full WC article: “Left handed helices can only be constructed by violating the permissible van der Waals contacts” Given the nature of the molecular model building tools that WC had at their disposal,* I suspect we must forgive them this assertion. But of course, building models using the van der Waals constraints (amongst others of course) is what modern computers are really very good at. So what might a modern visitation of this very issue yield? Shown below is a small DNA duplex, named d(CGCG)2 (DOI: 10.2210/pdb1zna/pdb) This uses only the CG base-pairing motif (the other of course is AT). Well, it turns out that DNA constructed from CG-rich duplexes does NOT necessarily adopt a right handed helix after all! WC (for this particular condition) were in fact wrong, and clearly the van der Waals contacts are not after all objectionable. Left-handed helices (as a left hander myself, I am naturally drawn to them) are also known as Z-DNA (the right handed form is called B-DNA), although many left-handed representations have in fact been drawn in error. The DNA duplex d(CGCG) showing a left handed helix. The ribose is in the 2E conformation. Click for 3D and see if you can find any objectionable van der Waals contacts! The model when stripped of its water molecules, is then of a size (250 atoms) which is easily amenable to a modern quantum-mechanical DFT calculation. Importantly, this has to include dispersion corrections (the van der Waals contacts referred to above) to get the correct geometry, and one can use e.g. ωB97XD/6-31G(d) + continuum water solvation correction to compensate for the missing waters (see DOI: 10.1039/C0CC04023A for an example of its use for a large molecule, or indeed this post). In truth, this combination of characteristics in a model has only recently become possible for a molecule of such size. Well, now that a good accuracy wavefunction for e.g. d(CGCG) is possible, what might one do with it? Well, the chiro-optical properties might be calculated (see DOI: 10.1002/chir.20804), including the optical rotation at a specified frequency, or e.g. the electronic circular dichroism spectrum. Such properties are normally computed only for much smaller molecules. Watch this space (or the journals). * Note added in proof (as the saying goes): This article by Derek Barton published in 1947, some six years before WC claimed “violation of the permissible van der Waals contacts“, established clearly the principles behind the model building by WC and in many ways could be described as the start of quantitative molecular model building. The very same equation used by Barton to model dispersion attractions is still used in e.g. the ωB97XD DFT method noted above. This entry was posted on Wednesday, December 29th, 2010 at 11:14 am and is filed under Interesting chemistry. You can follow any responses to this entry through the RSS 2.0 feed. You can leave a response, or trackback from your own site. Watson and Crick assigned their famous helix as a right handed one. Two years earlier, Pauling had pondered the handedness of helices in proteins. He got it wrong!